A significant new Swedish study shows fluoride in drinking water, at the concentrations used for community water fluoridation, has no effect on IQ or other measures of cognitive ability. Fluoride levels in Swedish drinking water (mg/L). Variation between municipalities. Source: Aggeborn & Öhman (2016). Similarly, it has no effect on diagnosis or prescription of medicines for ADHD, depression, psychiatric illnesses, neurological illnesses or muscular or musculoskeletal diseases. On the other hand, the study showed positive effects of fluoride on income and employment status – most probably because better dental health is beneficial in the labour market. It involved a much large sample. Over 700,000 individuals were involved. The numbers included in specific measurements varied but they were much greater than those used in the studies cited by anti-fluoride campaigners. For example, almost 82,000 were involved in the cognitive ability comparisons – compared with a few hundred at the most in the comparable studies cited by anti-fluoride campaigners. Estimates of effects were much more precise (as expected with large numbers of subjects) than for previous studies. The effect of fluoride on cognitive ability was always close to zero and for practical purposes was zero. Statistical analyses were based on continuously varying fluoride levels – a much better approach than the simple comparison of data for low and high fluoride villages used in the studies cited by anti-fluoride campaigners. Sweden is an ideal country for studying effects of fluoride at these low concentrations. It does not have artificial water fluoridation but its drinking water contains naturally occurring fluoride. The fluoride concentration in drinking water depends on the geology of the region so different Swedish communities consume water with different fluoride concentrations. 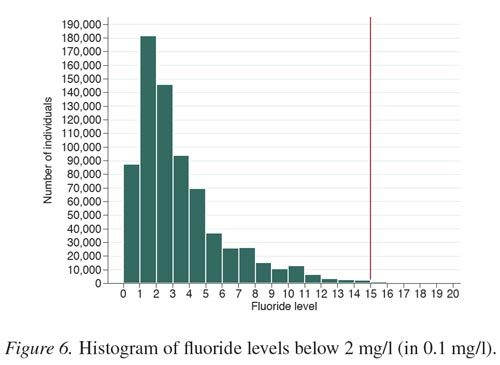 This graphic from the paper shows the number of people drinking water with various concentrations of fluoride. Note – the steps are 0.1 mg/L and although concentrations above 2.0 mg/L occur they are relatively rare. Sweden makes no attempt to remove excess fluoride until the concentrations exceed 1.5 mg/L – the maximum recommended by the World Health Organisation. For comparison, the recommended optimum concentration in New Zealand is 0.7 mg/L. The authors considered the effects of fluoride on the prescription of medicines for ADHD, depression, and psychoses. They also looked at psychiatric and neurological diagnoses from outpatient and inpatient registers, as well as diagnoses of muscular and skeletal diseases. Anti-fluoride campaigners often claim fluoride has a harmful effect on these health problems. The lack of any effect of fluoride on IQ and other psychological and non-psychological estimates suggest that fluoride would have no effect on long-term outcomes like income and employment status. However, the authors suggested that it could have a positive influence on these outcomes because of better dental health. This is an important study. It involved large numbers of people, estimated outcomes were far more precise than in previous studies, it used continuously varying concentrations of fluoride instead of simply comparing high fluoride and low fluoride villages, and it considered possible long-term outcomes like income and employment chances. The advantages of this study compared with the generally poor quality studies cited by anti-fluoride campaigners should put to rest arguments used by those campaigners. In particular, it should make the current campaigns relying on to IQ and cognitive effects irrelevant. The authors comment that their data shows there is no need to consider negative health effects on consideration of the cost-effectiveness of community water fluoridation. I wonder if, in fact, these results will encourage policy makers to consider the cost benefits of improved income and employment chances in future calculations of the cost-effectiveness of fluoridation programmes.